Greenville SC -Over the past six weeks, we have been answering your most searched questions – and we have covered a lot of ground solving the HVAC problem causing your issues. Instead of having to read through each of these posts, we are condensing all of the answers and solutions we have given you into one convenient post. Now, this will be a quick explanation, and if more information is needed, the original posts are available, or you can always call an expert at General Air of Greenville South Carolina. Our first week covered some possibly benign issues, focusing on explaining why an HVAC problem might cause leaking water, the potential repercussions of that, and why an HVAC might be making too much noise. Both of these HVAC problems had fairly simple explanations, but both could have serious problems if not resolved. To answer why your HVAC might be leaking water, it’s important to source your HVAC problem. It could be a clogged or disconnected drain pipe, which might cause an overflow or small leak to gather. This could be fixed with a simple inspection from an HVAC professional, and a quick repair or cleaning. A more serious HVAC problem could be a poorly installed system of drain pipes, which could cause havoc in your house. A poorly installed system is very difficult to fix, and can lead to poor cooling, and leaking water. This HVAC problem needs to be solved quick, as leaking water buildup can cause harmful mold or mildew. This HVAC problem can be the most frustrating. Nothing is more annoying than a heater that rattles and bumps and keeps you up at night. Luckily, this is mostly caused by a very fixable HVAC problem. The main reason your HVAC might be making noise could be the fact that the system as a whole is unbalanced. Simply putting a fire-resistant material carefully underneath the unbalanced edge could fix it in a quick second. If the HVAC problem is a whistle, it is probably an air filter that needs to be replaced, and a simple swap should mitigate the noise. Unfortunately, if these solutions did not fix your HVAC problem, it could be caused by loose bolts on your system, which would require help from the professionals at General Air of Greenville SC. In order to best solve this HVAC problem, it is important to establish what exactly your HVAC smells like. Likely caused by overworking your HVAC system. A system that is too small, and overworked, can start to smell like electricity from its constant excessive use. It could also signal a short in the wires, and if smoke is seen, immediately turn off the system, call an expert, and keep an eye out for fire and notify your fire department if it does catch. If your HVAC system smells like oil, it is likely that there is actually an oil leak. Check for obvious signs of a leak, and if not, it could be more benign. Most systems burn off excess dust and debris once started after a long period of being dormant. This can cause an oil like smell, that can be easily mistaken. Always be safe and call an expert at General Air of Greenville South Carolina. It is likely that if you smell mold in your house, that there is mold in your house. It can be caused by your HVAC system in a few ways, from leaky pipes, to condensing too much air. If there is a mold growth, call a General Air expert, and work to solve both the mold and the cause of the moisture. This HVAC problem could be caused by a burner starting up after a long while being dormant, or a genuine gas leak. 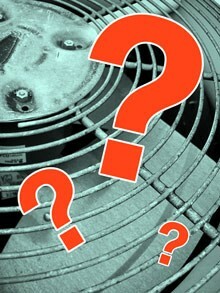 If the smell persists after a while, call General Air in Greenville, S.C.
Why is My HVAC Not Blowing Cold Air? The HVAC problem could be as simple as your outside unit, which vents the hot air and compresses to create cold air, could be blocked. A very gentle hosing and picking out of leaves could help your air flow dramatically. This one could be a little embarrassing, but if your fan is set to “ON”, it will always be blowing air – even when cold air isn’t flowing. Simply switching it to “Auto” will help eliminate this! It is also possible that your air filter is blocking your air flow, causing your HVAC problem. Remove it and inspect, and replace if it is clogged or dirty. Can cause freezing, hissing, and bubbling noises. Needs to be professionally replaced. This will require the General Air professional to replace the compressor, which is no small task. Could keep fans and compressor from running properly, an easy fix for a General Air professional. There you have it, this is your go-to guide for your most searched questions that we’ve answered over the past 6 weeks. A collection of two months of research and problem solving condensed into this blog post. If you did not find a solution here please contact the experts at General Air of Greenville for more help.